Building a single parking spot can easily cost more than many Americans’ life savings. In the latest issue of Access Magazine, retired UCLA economist Donald Shoup brings this point home to illustrate the huge financial burden imposed by minimum parking requirements, especially for poor households. 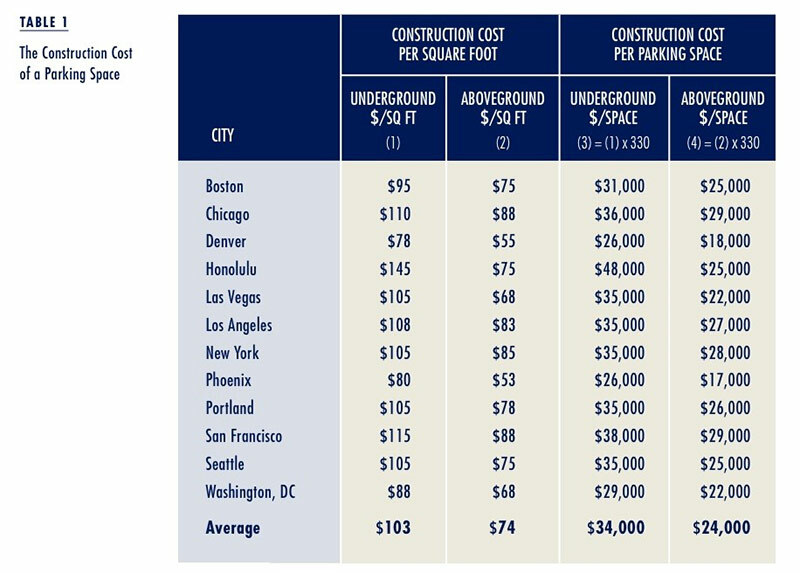 The average construction cost of structured parking, across 12 American cities, is $24,000 for an above-ground space and $34,000 for an underground space. (Surface parking spaces are cheaper, but keep in mind those prices don’t include the cost of purchasing land.) Those costs get bundled into the price of everything, driving up the cost of living even for people who don’t own cars. The burden of parking requirements, which mandate the construction of parking spaces that otherwise wouldn’t be built, is most acute for people of color. A more equitable policy would be to simply do away with parking requirements, which in London cut the number of new parking spaces in half. Barring that, even just reducing parking requirements can still have a profound effect on the cost of living, Shoup says. I am 100% in favor of removing parking space requirements from all development regulations. I’m a little confused about the race angle in this piece (and from Shoup too). I suppose it’s fashionable in 2016 to map any observation about the world into an associated observation about racial justice. However in this case, I feel it would have been more accurate and more inclusive to simply say that parking requirements impose more acute costs on poor people, or people having low/negative wealth, whatever their race. I agree with Mr. Lahey. Parking requirements downtown are not necessary. There is plenty of public parking already. Everywhere else in a city like Louisville, you generally need to add parking. Contrary to the public bus dream-world that Ms. Schmitt longs for, the vast majority of us will continue to have cars. Outside our largest cities, most people (even the working poor) will still drive to the grocery or to Walmart. It is more convenient than a bike or a bus. Ms. Schmitt’s introduction of race here seems to be typical of her writing style. She seems to care more about political spin than truthful information. Inserting race is unnecessary. The reality is that in a mid-sized city like Louisville, the vast majority of us do prefer cars for personal transportation. This is not New York City or Central London; even poorer folks here usually have a car. This is a false issue in Louisville. You better not disagree with the left wing race baiting fascist agenda on this site or they’ll just delete your comments and block you like they’ve tried to do to me. This site has an agenda to promote they don’t care about facts that’s why all the figures in this article are from 2011. If it doesn’t fit the anti automobile, obstructionist, leftwing NIMBY agenda forget about it. Jason, I think you are being too harsh on Broken Sidewalk. I find the website to be very useful and interesting, and the editors bring a lot of important issues up for discussion that don’t see daylight in more conventional media outlets. I think the editors do have an agenda, or at least a set of policy prescriptions, that I don’t entirely agree with, but the bias is upfront and the editors don’t seek to silence or dehumanize those with opposing views. Citing figures from a 2011 study isn’t really that bad. It takes time and money (probably **whispers** taxpayer money) to do a detailed study like the one in question. If the study was done in 2011 and the country hasn’t really fundamentally changed since then, infrastructure-wise, it’s OK to just look at the data from 2011. If you have any more recent or more appropriate numbers, please share them.